In completing this comprehensive research study, 1,068 telephone interviews were conducted with rural Minnesotans. The full report can be found at www.RuralPulse.org. 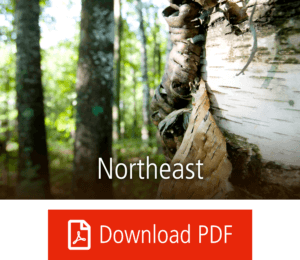 To provide a localized perspective, study findings for Northeast Minnesota are included in the following pages and contrasted with overall rural Minnesota responses. Intended to serve as a regional snapshot against full study observations, data reflects a statistical reliability of +/- 7.8 percent at the 95 percent confidence level. Also, please note that results within regional reports do not include communities of 35,000+; these cities are grouped within metro Minnesota findings – see full report for more information. 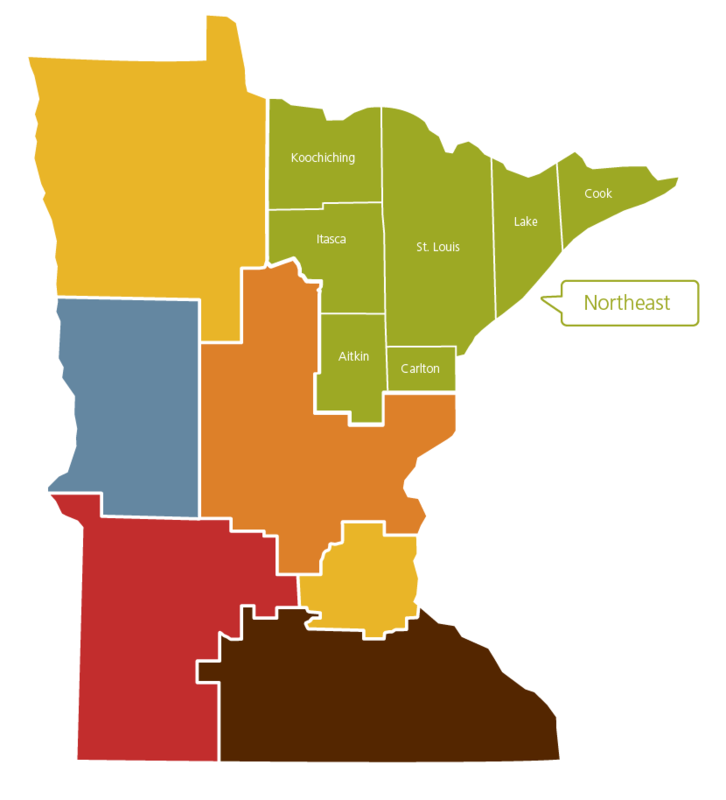 More than four in five residents in Northeast Minnesota feel that they can make a positive impact within their local community, and believe their community works together effectively. Northeast residents were most likely to agree that their community performed well in caring for the elderly, crime control, offering lifelong learning opportunities, making sure that every student succeeds and environmental stewardship. They were less likely to agree that their local area did well at providing childcare availability, cultural/arts opportunities, affordable housing, and addressing opioids and drug abuse. Northeast residents felt their community has improved since 2016 in providing accessible public transportation for all, including the disabled. An area that decreased in satisfaction since the 2016 study was offering adequate healthcare services. 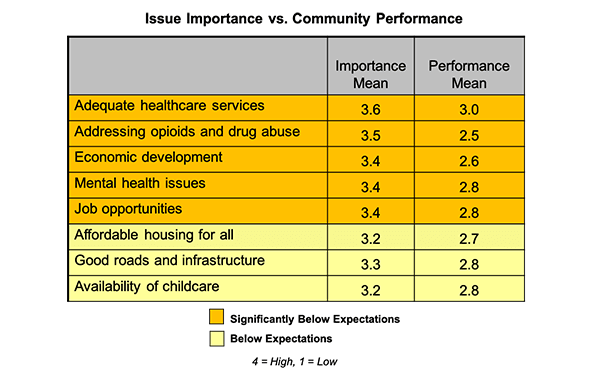 When comparing issue significance and satisfaction, Northeast Minnesotans felt their communities are underperforming in several key areas, most specifically, providing adequate healthcare, addressing opioids and drug abuse, economic development, mental health issues, and job opportunities. Fifty-seven percent of residents in Northeast Minnesota believed the needs of rural communities are important to policymakers. A significant percentage did not agree rural voice is being heard, however. The most critical issues to address in the Northeast region were said to be jobs, healthcare, opioids and drug abuse, mental health, economic development, affordable housing and availability of childcare. Twenty-eight percent of residents felt the local economy has improved within the past year, reflecting a continued increase since 2013. While rural Minnesotans continue to experience a rebound in the economy, there was only 49 percent who felt there are sufficient living-wage jobs. Sixty-seven percent believed Northeast region communities maintain/grow job opportunities. Fifty-nine percent felt that economic development is being promoted well, up from just 41 percent in 2016. 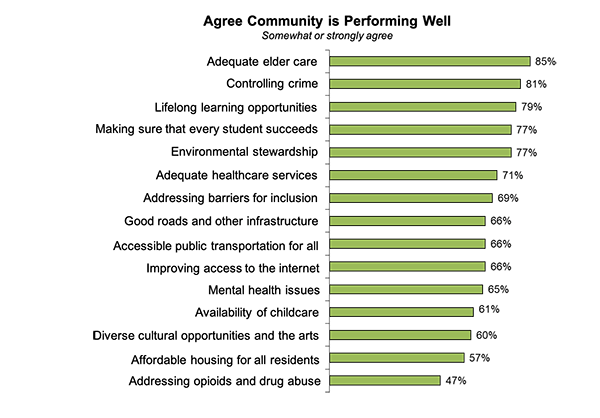 Sixty-seven percent felt there is an adequate workforce available for local businesses. 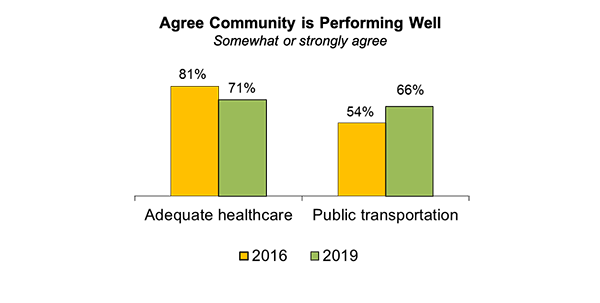 A third said their household income had increased over the past year. Job losses have declined since 2016 study findings. 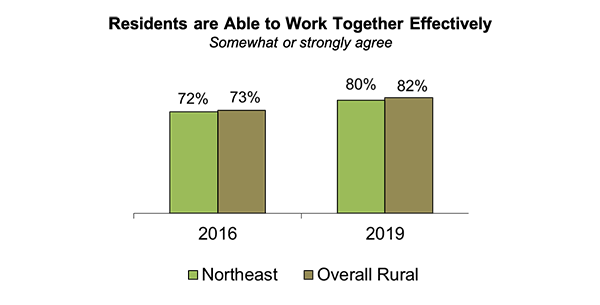 One in five said that they do not expect to live in their same community five years from now. Twenty percent have considered moving to a metropolitan area – a slight increase from 2016 study findings. Many say the search for job opportunities is the motivating factor for considering relocation. Just over half of Northeast residents said they have served in a leadership capacity, an increase from 2016 study findings. Of those who have not, more than a third say that they would definitely consider serving in leadership if asked – also an increase in interest from 2016 findings for Northeast respondents. Just over half believed that people fro diverse backgrounds fill local leadership roles. Slightly less than half of residents in Northeast Minnesota said that they have at least some close friends of a different race or culture. Northeast residents were most likely to feel the groups that experience bias, discrimination or harassment within their community include those with drug or mental health issues, Native Americans, gays and lesbians, transgender individuals, and the homeless population. More than four in five residents of Northeast Minnesota believed people in their community are able to stand up to hatred and discrimination. Overall, seven in 10 Northeast region residents are optimistic about their community’s future.